All Progressives Congress (APC) bigwigs from the South-south have reportedly abandoned the party’s candidate in the inconclusive Bayelsa State governorship election rescheduled for January 9, 2016 midway. 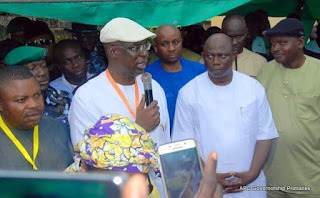 Speaking with LEADERSHIP in a telephone interview today, one of the leaders of Friends of Bayelsa, Otobo Osborne, said APC bigwigs like Edo State Governor Adams Oshiomhole; Minister of Transport, Rotimi Amaechi and APC National Chairman, Chief John Odigie-Oyegun are not giving Chief Sylva support to clinch the Bayelsa Governorship seat. According to him, these APC heavyweights in the South-south had, in the buildup to the governorship primaries, advised the party leadership and President Muhammadu Buhari against fielding Chief Sylva whom they believed lacked winning capacity. He further alleged that these party leaders are secretly supporting the re-election of the Peoples Democratic Party (PDP) governorship candidate, Hon. Seriake Dickson.